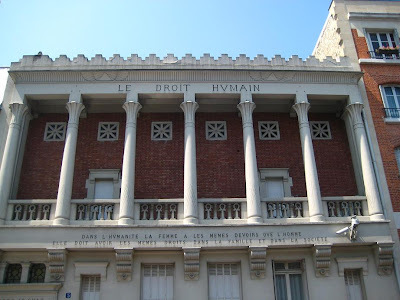 In the city where the déclaration des droits de l'homme was pronounced and adopted sits a strange and intimidating building. The declaration famously stated that 'tous les Hommes naissent et demeurent libres et égaux en droit' (all men are born and remain free and equal in rights), but what about women? Written large on the facade of this building is seemingly a riposte to this statement - but what is this structure? Built in a strange mixture of Greek neo-classical with Egyptian touches, this structure on the Rue Jules Breton in the 13th arrondissement belongs to Le Droit Humain. 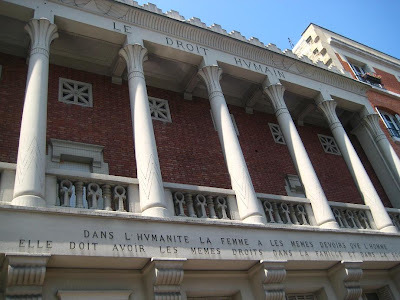 Their motto is written across the width of the facade; "Dans l'humanité la femme a les mêmes devoirs que l'homme. Elle doit avoir les mêmes droits dans la famille et dans la societé" (In humanity women have the same obligations as men. They should have the same rights in the family and in society). An interesting and thoroughly modern message, especially on a construction from the early 20th century, but who are Le Droit Humain? Above the entrance door is a clue. 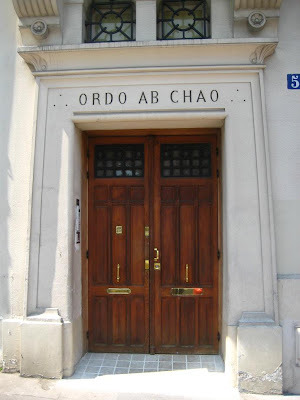 Ordo Ab Chao. Order from chaos - the international motto of freemasonry. This building is clearly therefore a masonic lodge or temple, but what is the connection with feminism? The answer is one woman; Maria Deraismes. 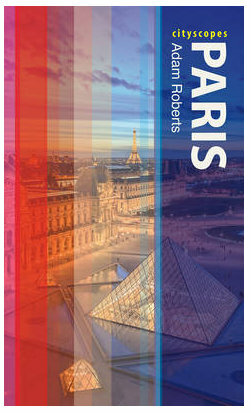 She was the first woman to be ordained in a masonic ceremony in France in 1882, but after this caused a split in the lodge where she had been ordained she soon found herself removed. After spending a decade essentially as a one-person lodge, she decided one day to invite a group of several highly educated women to her home, amongst which were active feminists and respected scientists. She then slowly initiated them through the symbolic grades, and together they formed a new lodge; Le Droit Humain. They were later joined by a man, Georges Martin, and the lodge became mixed. It was later Martin who ordered the construction of this temple. "Masonic Meetings begin and end with a symbolical ceremony, but that which takes place inside the Temple cannot be revealed by articles, because it is inherent to an initiatory experience which cannot be expressed in words"
What becomes striking therefore is the inherent contradictions and incongruities an organisation that declares an openness to the world but then practices rites behind locked doors. This building nevertheless remains a very graphic reminder of the battle for equality, and although we may never know what takes place inside, we do at least know that it was here that several small steps were taken towards the recognition of the role women could play in all sectors of society. I like the way the lettering appears to have been typed on to the building without regard for aesthetic considerations. Very earnest. Les femmes ont tant essayé de rejoindre les hommes que parfois elles oublient qu'elles ont différentes ce qui fait leur richesse. Bien sûr les femmes ont les même droits que les hommes mais ce sont elles qui "portent" les enfants ; il ne leur faut pas renoncer aux avantages sous prétextes d'égalité, se créer des obligations supérieures. En Occident, les femmes n'ont pas trop à se plaindre ; ailleurs leur vie est souvent en danger, on ne parlerait plus d'égalité mais d'équité, de justice pour les femmes. C'est facile de dire cela, ceci dit, à notre époque et là où nous vivons... Ce bâtiment et cette inscription sont un magnifique témoignage. Sort of like every government in the world. A lot to be said about freemasonry, but no room or time here. Whatever the way and the means, women's fight for equal rights was (and is still) needed! Do the French go in for fraternal organizations? They used to be a much bigger thing in the USA. Besides the Masons you have the Knights of Columbus, the Odd Fellows, the Moose Lodges, the Elk Club, the Shriners, the Kiwanis Club ... but I think they're all dying out. Younger generations aren't interested.